Passionate about the rights of people with communication and swallowing needs? Wanting to get involved in a campaign that makes a difference today, and tomorrow? Get behind this campaign and help spread the word – everyone has the right to life essentials. Show how your service works in partnership to enhance lives. Giving Voice is a vehicle for you to use to share your knowledge and experience, enabling you to be proactive in engaging with local decision makers to inform service design and innovation. Get on board and strengthen partnerships with our clients and communities, and education, health, social, and justice colleagues. Please email us if you require these resources in another format. Show off your service: Invite local politicians to see the work you do and how important it is to your service users. Engage the directors of your organisation in the work you do to support your clients and their whanau. 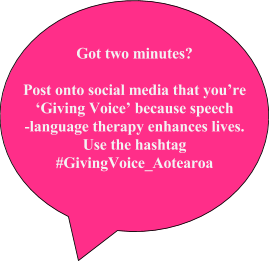 Combine the campaign with existing activities planned for your service: Use the Giving Voice Aotearoa logo and brand to help promote the importance of communication in everyday life and life essentials. Raise awareness: Raise awareness amongst your department colleagues and organisation to ensure that doctors, social workers, teachers, physios and other members of your team understand how speech-language therapists make a difference. Collaborate with other local therapists and your local NZSTA champions to run awareness raising events. The community will be interested to know what services are available.